WAGGGS – Girl Scouts, Why Not? The World Association of Girl Guides and Girl Scouts (WAGGGS) currently advocates for contraception and “abortion rights” on behalf of its girl members, the majority of whom are minors. GSUSA is the largest member organization of the World Association of Girl Guides and Girl Scouts (WAGGGS), making up a third of its 10 million members worldwide and paying approximately 1.5 million dollars annually to WAGGGS based on the number of registered GSUSA members. youth reproductive, abortion, and sexual rights. GSUSA’s own tax returns show the money flow to WAGGGS. WAGGGS promotes a campaign for “sexual and reproductive health services,” including “emergency contraception in order to avoid unintended pregnancies” and “accessible, affordable abortions.” WAGGGS promotions of “abortion rights” on behalf of its girl members can be found on the WAGGGS official website. All young people must have access to comprehensive sexuality education and sexual and reproductive health services, including contraception and emergency contraception, in order to avoid unintended pregnancies. Accessible, affordable and safe abortions should be made part of the minimum packages of sexual and reproductive health services. All young people should have access to psychosocial health services for prevention of gender-based violence and violence against women. How is my local Girl Scout troop connected to WAGGGS? Girl Scout troops provide financial support to WAGGGS through their annual membership dues, the annual Juliette Low Fund, and the annual World Thinking Day Fund. Each Girl Scout in every local troop pays an annual membership fee of $12 that goes directly to GSUSA (Girl Scouts of USA). None of the membership money stays at the local troop or council level. Charity review of GSUSA from the Better Businesses Bureau issued June 2009 for the fiscal year ending September 30, 2008, GSUSA program under the heading “Financial”: Source of Funds lists “Membership dues”: $33,214,000. In turn, GSUSA pays yearly membership dues to WAGGGS. 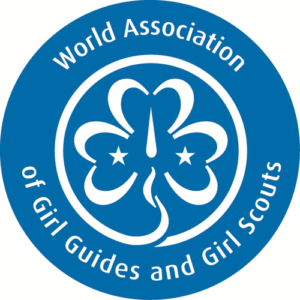 GSUSA has the largest membership in WAGGGS. Charity review of GSUSA from the Better Businesses Bureau issued June 2009 for the fiscal year ending September 30, 2008, under the heading “Programs”: International services: $3,384,000. Essentially, more Girl Scout members equals an increased annual “membership quota payment” from GSUSA paid to the pro-abortion WAGGGS organization. Detailed information on each member country is provided under the Our World tab of the WAGGGS website. This information includes the country’s census, the number of Girl Guides or Girl Scouts in that country. The WAGGGS Members document is a summary list of all these member countries, and the number of GG/GS in that country. Based on the number of GG/GS, the United States is the largest member of WAGGGS (GSUSA website), (Leader Magazine) & (CEO of External Affairs) with 3,578,760 Girl Scouts. In summary, all Girl Scouts have a financial relationship with and are members of WAGGGS through their annual membership registration. Each Girl Scout’s annual registration triggers a quota payment to WAGGGS. In 2006, GSUSA paid an estimated $393,959 to satisfy the WAGGGS “membership quota payment” for Catholic Girl Scouts alone. Catholic Girl Scouts are directly responsible for this amount of money paid to WAGGGS when they register to be a Girl Scout each year. Please note that 2006 is the most currently available comprehensive membership statistics provided by WAGGGS. $1,762,358 (see GSUSA’s 2006 “membership quota payment” paid to WAGGGS) ÷ 3,578,760 (number of youth and adult Girl Scout members in 2006 from GSUSA posted on the WAGGGS website) = .49₵ (In 2006, GSUSA paid a membership fee of approximately .49₵ per girl to WAGGGS). 800,000 Catholic Girl Scout members (Bob McCarty estimated the number Catholic Girl Scout members) x .49₵ (GSUSA paid a membership fee of approximately .49₵ per girl to WAGGGS) = $393,959 each year (approximate amount of money that Catholic Girl Scout members are responsible for that is paid by GSUSA to WAGGGS for their membership in the organization). The WAGGGS website lists 145 member organizations or countries that are members of WAGGGS. There are 121 Full Member countries/organizations and 24 Associate Member countries/organizations. Detailed information on each member country is provided under the Our World tab of the WAGGGS website. This information includes the country’s member status (Full or Associate), a census or count of the number of GG/GS in that country, developments, programs, and events. As mentioned before, the WAGGGS Members document is a summary list of all member countries, and the number of GG/GS in that country as of a certain date. In total, as shown on the WAGGGS Members document, there are 8,136,955 GG/GS associated with the 121 Full Member countries. Based on the number of GG/GS, the United States is the largest member of WAGGGS (GSUSA website), (Leader Magazine) & (CEO of External Affairs) with 3,578,760 Girl Scouts or approximately 44% of the total GG/GS in WAGGGS. The United States is almost three times larger than the next largest country, India, with 1,305,028 girls or approximately 16% of the total. The top four countries (U.S., India, Philippines, and U.K.) make up approximately 76% of the WAGGGS Full Members based on the number of GG/GS. US, India, Philippines, and UK make up approximately 76% of WAGGGS membership. The remaining 117 full member countries of the 121 Full Member countries make up the remaining 24% of girl members of WAGGGS. These amounts are located in GSUSA’s tax return for those years. This is further explained as “Membership Quota Payment”: $1,762,358 in the “Payments to Affiliates Schedule” on page 38. 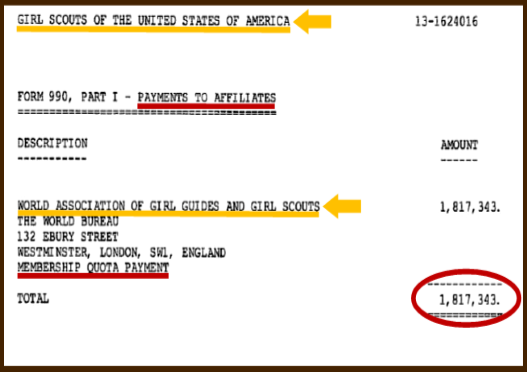 This is further explained as “World Association of Girl Guides and Girl Scouts”: $1,817,343 in the “Payments to Affiliates Schedule” on page 28. After 2007, the format of the tax return was changed and the line item “Payments to affiliates” was moved. In GSUSA’s 2008 and 2009 tax returns, the Membership fees or “quota” are located on page 10, Part IX, line 21; however, no detailed supporting schedule “Payments to affiliates” is provided. Despite the lack of a supporting schedule, it is very likely that this amount (Payments to affiliates), as in previous years, still represents membership fees or “quota” paid to WAGGGS. In GSUSA’s 2008 tax return located on page 10, Part IX, line 21: “Payments to affiliates”: $1,553,308; GSUSA paid $1,553,308 to WAGGGS for membership fees in 2008. As stated on page 31 and 35 of WAGGGS’ Report and Financial Statements for the year ended December 31, 2008 (2008 Report and Financial Statements) the total membership fees or “Quota” (as it is referred to in the report) income was 1,669,000 Euros. 63% of WAGGGS membership fees came from GSUSA in 2008. 64% of WAGGGS membership fees came from GSUSA in 2009. Please see the following 2 articles where Bob McCarty, Executive Director of the NFCYM, has estimated the number of Catholic Girl Scout members (800,000 or 700,000). The following is documented proof of the relationship between WAGGGS & IPPF (International Planned Parenthood Federation): International Planned Parenthood Federation (IPPF) youth group advocates with WAGGGS for sexual and reproductive health (SRH). 1) Family Planning: Meeting Challenges, Promoting Choices – The Proceedings of the IPPF Family Planning Congress, New Delhi, October, 1992. 2) The International Law of Youth Rights (1995). Kluwer Academic Publishers. You can also view GSUSA’s Form 990 Tax Returns (Payment to Affiliate: Membership Quota payment to WAGGGS) for 2002, 2003, 2004, 2005, 2006 and 2007 (please be sure to view all 7 pages). GSUSA is classified by the IRS as a 501(c)(3) charitable corporation, which means they are a non-profit organization and are exempt from paying taxes. Since these types of charitable corporations rely on donations from the public to operate and survive, their financial information including tax returns are considered public information. All 501(c)(3) corporations must file a Form 990 each year with the IRS to maintain their tax exempt status. You can also access these tax returns at this 990 site.